Basements get hit with moisture from multiple angles of attack. Because they are underground in many instances, the walls will naturally develop condensation from outside temperature changes. Many homeowners also place their furnace, washing machine, and other moisture-producing appliances in the basement, creating higher humidity levels. The best way to combat these humidity levels is to introduce the best dehumidifier for a basement into that indoor environment. Whether you want a cheap dehumidifier for a basement or you’re looking for something that is feature-rich and price doesn’t really matter, it is important to compare and contrast the various makes and models available in this category to make sure you’re getting the right appliance. The chart below will help you do just that. Here’s the issue: most basements are contained within a concrete foundation. Concrete is porous by nature and water is patient. It will eventually find a way to seep through the walls, especially if there are cracks or imperfections in the wall from the construction process. Even aging can cause more moisture exposure to a basement and cause an increase in humidity levels. Once this process happens, it creates a negative cycle for your indoor environment. More moisture means more humidity. More humidity means more damage to your basement. More damage means more moisture. And so it repeats. This moisture can also damage your plumbing. It can cause metallic appliances to begin corroding. If you have a finished basement, it can cause any wood products to swell, weaken, or rot. Many insects and common household pests are also attracted to high humidity levels. This is why a basement dehumidifier is necessary in many homes. Even if a basement doesn’t feel damp, it might smell damp and that’s a warning sign that should be taken seriously. Don’t wait around for condensation to develop and potentially threaten the very structure of your home. Install a dehumidifier and you’ll interrupt that negative moisture cycle that can be so damaging. How Do the Best Basement Dehumidifiers Work? Dehumidifiers are pretty basic in design: they remove moisture from the air by using fans to move it over refrigerated coils. This forces the water out of the air, where it is placed into a collection container or sent into your home’s drainage system. When a dehumidifier is given a capacity rating, this lets you know how much water it can pull out of the air in your basement over a 24 hour period. This is why selecting the right product through our basement dehumidifier reviews is such an important part of the shopping process. If you select a model that has an inadequate capacity level, then you won’t be able to effectively control basement humidity levels. They’ll be better than they were, but they may not drop to healthy levels below 50%. If you select a model with too much capacity, then you’ll be spending more money than necessary to correct the problem. Most basement dehumidifiers offer a capacity of either 50 pints or 70 pints. We highly recommend purchasing one of the best hygrometers to determine what your current humidity levels happen to be before making a final dehumidifier selection. You’ll then be able to use the hygrometer to monitor your humidity levels continuously. We highly recommend these specific features if you’re looking to invest into one of the best basement dehumidifiers today. An adjustable humidistat. This will allow you to maintain a more specific control of your basement humidity levels. You can set the dehumidifier to a specific percentage and then the appliance will work to maintain that level on its own. Built-in hygrometer. If you frequently use your basement for high moisture activities, like washing clothes or taking showers, then this feature can help you measure current humidity levels so they can be accurately maintained. Automatic shut-off. This feature helps you manage the utility costs of running a dehumidifier. It will shut off the appliance when humidity levels are at your preferred percentages. You might also wish to look through the basement dehumidifier reviews for features like a full tank indicator, drainage bypass, and automatic defrosting. Some homeowners may also wish to run their new dehumidifier in rooms other than their basement, so portability may also be a factor to consider in each review. The bottom line is this: if you want to make sure your basement can combat moisture, prevent mold development, and remain strong, then you’ll want the best basement dehumidifier helping you maintain that environment. What Are the Prices of Basement Dehumidifiers? Because many basement dehumidifiers are considered large capacity appliances, you’ll find that the cost of purchasing one is typically above $200. Below this price point are usually dehumidifiers that have a 30 pint or less capacity. Most homeowners will benefit from a 50 or 70 pint dehumidifier, which are typically priced from $250-$350 respectively. If you have extremely high humidity levels, a 95 pint dehumidifier may be your best option, with pricing typically beginning at $500 for these specific models. Could a portable humidifier be a solid option for your basement? Absolutely. 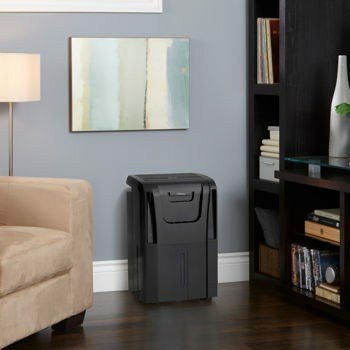 This particular small room dehumidifier is perfect for those smaller basements, laundry rooms, or even a finished basement area that needs a little help with its humidity levels. The noise rating is below 35 decibels on this model, so you won’t have to worry about a ton of noise pollution. The energy requirements for this dehumidifier are also quite low and it lets you know when it’s time to empty its tank. 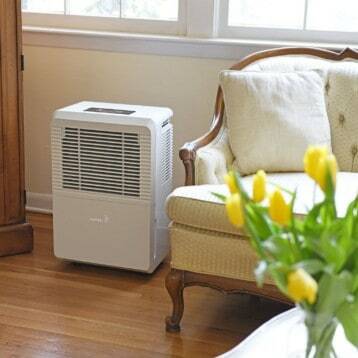 If you want an eco-friendly dehumidifier, you’ll want to give this one a close look. Why do we love putting this dehumidifier in the basement? For starters, it’s ridiculously effective. Even if you do your laundry in the basement, this dehumidifier will still give you the right levels of humidity all day long. It offers a 3.5 liter condensate bucket, with electric controls that allow you to set a specific humidity percentage. There’s a direct drain option that you can hook into your home’s drainage system and 2 fan speeds for some limited customization. Recommended for basements 1,500 square feet in size or less. Why is this one of the best dehumidifiers for the basement? For starters, it has no moving parts. It’s perfect for those homes with small kids who love to play with everything and sometimes unintentionally break things. It’s sturdy, has a removable 16 ounce water tank, and it will even help to purify the air for you. When the reservoir is full, the dehumidifier shuts off automatically. The small size may not work for large basements, but it’s quiet and compact and sometimes that’s what you need to get the job done. This is a beast of a humidifier and works in basements of almost any size. The ultra-high capacity will help to protect your home from mold and mildew. The design also helps to eliminate airborne bacteria that might find your basement an attractive indoor environment. Place this unit by your home’s drainage system and you’ll be able to have constant use if you want. The 6 foot power cord is one of the longest you’ll find on a dehumidifier today as well, which gives you some flexibility in placement. If you have a high humidity basement, you’ll want this dehumidifier. We liked using this particular dehumidifier for small basement areas. It’s one of the few models that utilizes UV light sterilization so you can kill mold spores, viruses, and other contaminants that may be in your air. The condensate tank is 2 liters in size, so you don’t have to empty it every day with the 240 ml of capacity this dehumidifier offers. It doesn’t work great is extreme humidity, but if it does work well to maintain a 35-50% humidity level for a basement. It earns our recommendation today. This 50 pint dehumidifier is rated to work in homes as large as 3,000 square feet, so it’s perfect for a basement of any size. It offers 3 different modes, including an auto dry mode, so you can receive the results that your basement needs. A washable air filter is included, as is a built-in pump, so there is flexibility offered in where you place this dehumidifier as well. A digital display shows you humidity levels or the current time. If you need an energy efficient model that is priced right, you can’t go wrong with this dehumidifier. There’s a lot to love about this particular dehumidifier for the basement. First is the capacity rating, giving you up to 60 pints of humidity extraction in 24 hours in a room that is up to 3,600 square feet in size. The R134A refrigerant this model uses is environmentally friendly, so you won’t have to worry about expanding your carbon footprint. The electronic controls are very easy to use. Casters on the dehumidifier give it some extra portability as well. If you need the best dehumidifier for the basement, then you might need this one today. At first glimpse, this model looks like a pretty standard dehumidifier. Since it’s priced near the top of the 30 pint range, it might even be easily ignored. Yet there’s an auto-restart option that kicks in after the power comes back on after an outage. Your adjustable humidity range is 30-90%. It offers you an auto-defrosting option, but is also designed to prevent frost build-up in the first place. The condensate bucket holds 12 pints so you have minimal maintenance after you get humidity levels under control. Ignore this dehumidifier at your own risk. Built for small spaces and an ultimate level of portability, this is the dehumidifier that gives your basement a silent punch of success against high humidity levels. It can absorb moisture in up to 300 cubic feet of space thanks to its renewable silica gel technology. You don’t need batteries, you don’t need power, and it can work for up to 4 weeks depending on the humidity levels inside your basement. An indicator window lets you know the condition of the crystals so you know when it’s time to make a change. You also can’t beat the price of this unique dehumidifier. This is your large basement option for dehumidification. Perfect for areas of up to 4,500 square feet, you have the direct drain operation and removable air filter features that you’d expect from a dehumidifier of this size. The LED display with electronic controls is conveniently place on the top of the machine, though you can bump them sometimes with a finger if you’re pushing this dehumidifier to a different basement location. Save money, limit humidity levels, and breathe better when you’re downstairs with this model today. The best dehumidifier for a basement depends on the size of your room and what chores you do downstairs. Consider all of these options today, compare them to your needs, and you’ll be able to find an effective and affordable solution to the high humidity levels in your basement.